Many of you may have heard of or seen the jaw dropping French sport, parkours (here). If you saw one of the more recent James Bond films, Casino Royale, then you’re in. All of that amazing, almost too-ridiculous-to-be-possible but true leaping, bounding and clamoring that occurred in the opening scene was parkours. And believe it or not, people really do this as a hobby, sport or thrill. Personally I can’t pretend to have this degree of agility, coordination or chutzpah but as I have written before (here), I do think we’ve made our built environment too safe and thereby, boring. Yes, public spaces and buildings designed for maximum safety and efficiency are enfeebling us and making us fat. It’s little surprise that when we do things such as ban running on our playgrounds (Broward County Florida), remove any play equipment that’s remotely fun, ban balls on playgrounds (Calgary) or totally isolate our children through design of our streets or neighborhoods that we lose them to the television or video games. Well, what about our office spaces? The same could be said for them too? Right? Sure. What can you jump off, leap over or clamor up? 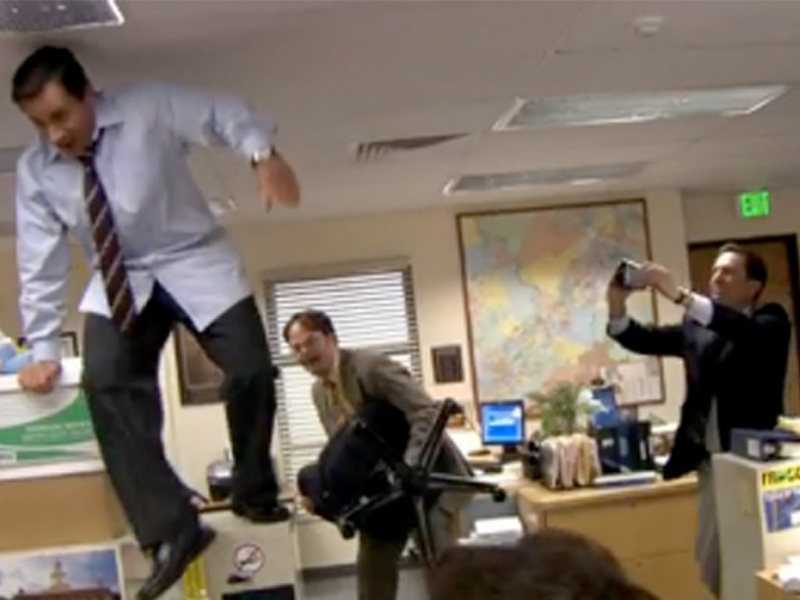 Quite frankly this clip from the Office cracks us up every time we see it.